Hope you had a wonderful holidays. We wish this brand new year will be a JOYful, peaceful, much better one for all of you in the whole wide world. We are going to introduce you our menus one by one from now on. The first one is our Teriyaki Burger for sure! This is our flagship product! It has a 100% Canadian beef pate covered with authentic tasty teriyaki sauce! Every customer who had tried this so far has been surprised and said "Wow! 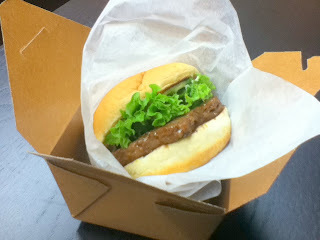 This is the best teriyaki burger I have ever had!". Yes, it is different, it is unique! Must try if you haven't done yet! The numbers of our facebook fans have just reached (and over) 200 on the January 2nd. We had a special offer on the whole day of the 3rd to show you our appreciation. Since then we started our special promotion as our daily routine throughout our facebook page and twitter messages. If you don't want to miss it, like us and follow us today! Very good food, but I suggest that instead of lettuce on the burgers, you add shredded nori. That would make it even better! Thank you for sharing your idea. It might be good adding shredded nori on it. It is hard to keep nori dry on hot juicy pate though. Well, we will think how we can do.